MC311 Customer Service Center is Montgomery County’s source for non-emergency government information and services. 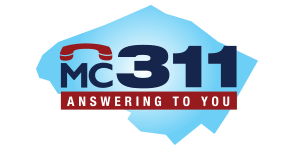 You can reach MC311 by calling 311 in the County or 240-777-0311, 711 for MD Relay TTY, from anywhere, Monday - Friday 7 a.m. – 7 p.m. Use the links on this page, or follow us on twitter @311MC311. Check Make The Right Call for more information. Customers who prefer to conduct business with Montgomery County in a language other than English can request translation assistance. The MC311 Customer Service Center offers a language interpretation service with over 150 languages available. After calling 311, press 2, for Spanish, or stay on the line to ask the next available customer service Representative to request to conduct the call in the language of your choice. Our translation service will be made available to you. Use Google translate at the bottom of this website to view the webpage with language of your choice. Frequently Asked Questions (FAQ) - English | Español. Palm Card - Englsh | Español. * Request service from your web browser.